With a beautiful mountainous landscape, Southern Utah is abundant in year-round outdoor activities. Whether you’re planning to visit in the winter to take advantage of the world-class ski resorts and snowmobile trails or during the warmer hiking-weather months, you’ll discover countless activities. If you’re looking for something new to do, you should try summer tubing in Brian Head! There’s nothing quite as exciting as sliding down the slopes at Giant Steps Tubing Park. 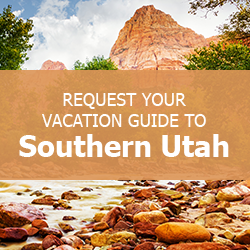 Let us help you discover all the fantastic activities available in Southern Utah! When you request a copy of our complimentary Vacation Guide, you’ll gain access to dozens of local recommendations on attractions like summer tubing in Brian Head and additional summer activities. This handy planner has helped countless travelers organize memorable family vacations. Get your copy today! Each summer, the Brian Head Resort converts part of the Giant Steps mountain into a summer tubing park! Much like snow tubing or sledding in Brian Head, avalanche tubing involves sitting atop an inflated tube and sliding down a track of slippery material. The best part of this park, which consists of several different runs, is that you don’t need to hike back to the top of the slide each time! A conveyor belt-like machine will carry riders back to the top. The Brian Head Resort offers so much more than just summer tubing during the warmer months. Mountain bikers can spend an entire day riding down more than 100 miles of mountain biking trails in the Mountain Biking Park. Bring the whole family to the resort for the day to enjoy the cliffhanger wall, crooked arrow archery, Giant Steps disc golf course, and peak shot trampoline. The mountain also features one of the best zip lines in Brian Head. If you plan on spending a lot of time at the resort this summer, you may want to consider purchasing a Brian Head season pass. For those travelers spending a short time in the area, you can purchase a day pass or buy tickets to select activities. Click here for directions to the Brian Head Resort. Visit the Brian Head Resort website to purchase tickets or get more information on specific activities. Family Time Vacation Rentals are perfect for travelers looking for the comforts of home with the convenience of location. You can select from our collection of properties near national parks or choose your rental based on which town you’re most interested in exploring. Multiple families traveling together will love staying in this large Overlook Lodge in Brian Head with the ability to sleep up to 20 guests. Stay just minutes away from exciting activities like summer tubing in Brian Head while enjoying a relaxing and secluded accommodation. Unwind in the private hot tub and admire the mountain vistas from the back deck.